Every day when I get the mail, it is full of flyers and catalogs from various schools. Most of them are for my senior, but a few are even starting to pop up for my sophomore. We have now officially entered the college process…and not just in the “that might be cool some day” way. In the past two weeks I have attended financial aid and college application seminars at the school for parents. Every single day there are colleges visiting the high school, and my daughter has the chance to talk with them. We’ve only done two college visits, but I know many of her friends have done as many as 10. Is it really supposed to be this complicated? I’m obviously a believer in education, having gotten a bachelor’s degree and a law degree myself. But I also only applied to one school for each of those and was perfectly fine with my choices. Did I just get lucky? Or would I have made the best of wherever I was? I think that’s where I am right now…wondering if this really needs to be so stressful or if my kids will make the best of wherever they end up. 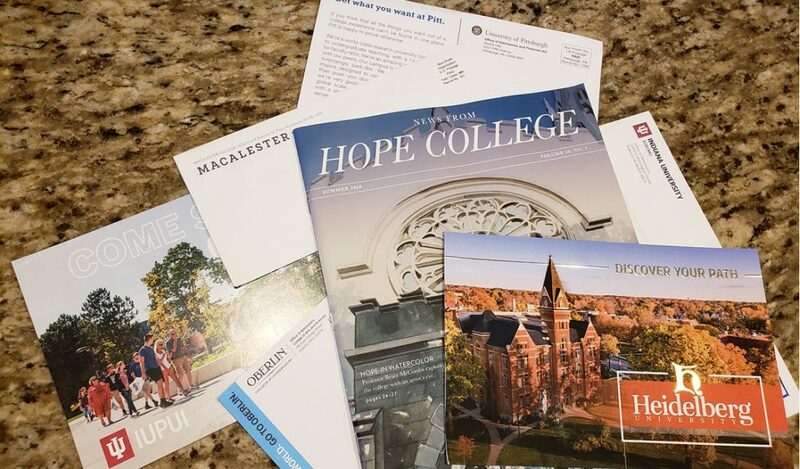 Thankfully all of the schools she is looking at take the “Common App,” which I have come to find out is a much simpler way to apply for schools without having to do lots of duplicate work. She’s not really stressing about all of it, which I guess is what keeps me from getting too stressed about it. I guess the real stress will begin when the dollar signs start coming in. For those of you who have been through this process recently, am I missing something? Is the key to their whole future really in picking the exact right school? Or has the college process started to take away from what should be one of the best years of their lives?